These are publications made freely available by either the author, a funding organization, or MSA. MSA will host additional open access publications about mineralogy, crystallography, petrology, and geochemistry that it believes to be of interest to its membership. If you have a publication you would like to post on this site, please contact the MSA Business Office. Michael M. Raith, Peter Raase, and Jurgen Reinhardt (2012, second edition) 127 pp. ISBN 978-3-00-037671-9 (English); 978-3-00-036420-4 (German); 978-3-00-040623-2 (Spanish); 978-3-00-046279-5 (Portuguese). Optical thin section analysis is an essential tool for rock and mineral characterization, whether as a stand-alone method or in combination with microbeam and XRD techniques. This liberally illustrated guidebook provides a concise overview on the basics of polarized-light microscopy and its application to thin-section-based mineralogical and petrographic analysis. The larger part of the guide covers morphological and optical properties of minerals. There are further chapters on the principles of microscopic imaging including adjustment procedures for optimal microscope use, and on measuring lengths, angles and crystal plate thickness under the microscope. The book’s emphasis is on practical aspects and methodical approaches in thin section microscopy. It neither intends to cover the in-depth theoretical background of crystal optics, nor does it provide tabulated data for minerals. The guide is designed as an easily accessible learning resource for students, a teaching aid for instructors and a quick-reference manual for any geologist or mineralogist who uses the polarized-light microscope for thin section work. Several of the chapters have reorganized and revised in the second edition, notably chapters 3.2, 3.4, 4.2.3. Chapter 3.2 now includes deformation-related features at the grain or thin section scale. The text and figures of chapter 3.4 have been revised and extended. Chapter 4.2.3 has undergone a major revision that should help the novice to better understand the physical background to some basic optical phenomena such as retardation and interference colours. The upgrade involves new calculated interference colour charts, including a new, previously unpublished Δn-d chart. The second edition guide is available at no cost in English, German, Spanish, and Portuguese. The reduced-resolution versions give acceptable printouts in A4 format, whereas the print-quality versions give optimal reproduction of the color figures. Brittani D. McNamee, University of North Carolina at Asheville and Mickey E. Gunter, University of Idaho (2014) 51 pages. The major goal of this laboratory manual is to teach students how to identify minerals. As such, we developed a lab manual integrated closely with the textbook and DVD by Dyar and Gunter (2008) illustrated by Dennis Tasa, with focus on the authors' "Big Ten" minerals. This lab manual puts more emphasis on understanding the relationships between a mineral’s structure and composition with its properties and the procedure in identifying minerals than memorizing a hundred minerals. The manual acts as a skeleton to build upon as the instructor sees fit, allowing the addition of mineral samples and exercises. Labs concentrate on four topics: 1) analytical equipment, 2) physical and optical properties, 3) mineral identification, and 4) special projects. The first two labs introduce the students to the different instruments used for mineral identification: 1) a tour of the X-ray diffractometer (XRD) and a scanning electron microscope (SEM) facilities with brief explanations of the concepts driving them and 2) an introduction to the polarizing light microscope (PLM). The next section of labs focuses on defining and learning the techniques to identify the physical and optical properties of minerals. Lab exercises begin with students comparing the properties of two or three different known minerals and then lead to observing the properties of and identifying an unknown mineral using the DVD’s mineral database. The students then apply their knowledge of mineral properties to the "Big Ten" minerals divided into labs by class (framework silicates, sheet silicates, etc.). Students use the DVD database and lab materials to observe and measure the properties of the minerals and to build their own mineral lab manual, which they can later use in Petrology. The pages in the manual can either be printed, or the students can fill them in electronically. The semester ends with two projects: 1) building a spindle stage and using it with the EXCALIBR program to expand the student’s understanding of optical properties of minerals and to aid in mineral identification and 2) assemble a collection of 20 minerals that must be identified by the students using the techniques and resources learned over the semester. John B. Brady, David W. Mogk and Dexter Perkins III (2011) i-viii + 406 pages. ISBN 978-0-939950-44-7. This book is an outgrowth of a workshop on teaching mineralogy held at Smith College in June 1996 and sponsored by a grant from the Division of Undergraduate Education, National Science Foundation (DUE-9554635). Seventy participants, from diverse institutional settings and from all academic ranks, met to explore common interests in improving instruction in mineralogy. At the workshop, participants took part as both instructors and as students. They had the opportunity to explore a variety of new instructional methods and materials and also to observe their colleagues as instructors. All were encouraged to test these activities in their own classrooms, to evaluate their effectiveness, to suggest changes to the authors, and to develop new and complementary exercises. The sourcebook before you is the product of this group effort. Within this volume you will find numerous exercises that can be applied in the teaching of mineralogy and related courses. There are hands-on, experimental, theoretical, and analytical exercises. All have been written with the hope of optimizing student learning. At the workshop there was little interest in developing a "prescriptive" approach to mineralogy by making recommendations on a specific content that might be universally applied in mineralogy courses and curricula. We recognize that every student population will have different needs, every faculty vi member will have her or his own areas expertise, every department will have its own curricular needs, every institution will have its own resources, and every geographic setting will provide unique educational opportunities. The exercises in this volume provide examples of innovative ways that mineralogy can be taught using a variety of materials and teaching techniques. We encourage you to use these activities in whatever ways will best serve your students. You may freely photocopy the exercises for class use, adopt these materials or adapt them to meet the special needs of your own course, and use these activities as models to help you develop your own new exercises. 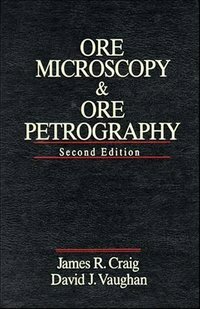 Ore microscopy and ore petrography - 2nd ed. James R. Craig, David J. Vaughan (1994) i-xiv + 434 pages. ISBN 0-471-55175-9. The study of opaque minerals or synthetic solids in polished section using the polarizing reflected-light microscope is the most important technique for the identification and characterization ofthe opaque phases in a sample and the textural relationships between them. Since most metalliferous ores are comprised of opaque minerals, this study has been traditionally known as ore microscopy and has found its greatest applications in the study of mineral deposits. It may be applied, however, as a general technique in the study of igneous, sedimentary, or metamorphic rocks containing opaque minerals and even in the study of metallurgical products or other synthetic materials. The objective of this text is to present an up-to-date introduction to ore microscopy for the student or professional scientist who is unfamiliar with the technique - an introduction that would accompany a course at the senior undergraduate or graduate level or that would provide the professional with a first step in familiarization. Emphasis is placed on the basic skills required for the study of opaque minerals in polished section, and information in the text and appendices on the more common ore minerals and assemblages provides examples. The first two chapters cover the design and operation of the ore microscope and the preparation of polished (and polished thin) sections. The third chapter dealing with qualitative mineral properties used in identification is followed by a chapter on reflected-light optics. The quantitative measurement of reflectance, color, and microhardness are treated in Chapters 5 and 6 along with overall schemes for employing these measurements in identification. Chapters 7 and 8 deal with ore mineral textures and paragenesis, and include a brief discussion of the study offluid inclusions. Chapters 9 and 10 are concise discussions of many of the major ore mineral associations observed under the microscope. Chapter 11 deals with the applications of ore microscopy in mineral technology. The appendices contain the data necessary to identify approximately 100 of the more common ore minerals-those likely to be encountered by the student in an introductory course andthose frequently encountered by the professional scientist. Abstract: Optical mineralogy has many fascinating though often complex concepts which underlie common effects observed in minerals and lapidary specimens fashioned from them. Doubling of images such as seen through a calcite rhomb is perhaps one of the most readily observed of these properties and could well have been one put to use centuries ago in a very practical way. The intriguing theory of the Viking’s use of a coveted stone to find their way in arctic waters has its roots in the ancient Viking Sagas, optical mineralogy, and in practical application by modern navigators. The proposed minerals thought to be the Viking “sunstone” are excellent models for understanding the optical phenomena of birefringence and pleochroism; the very properties which make them useful for navigation are also those which make them valuable to mineral and gem enthusiasts today (see Skalwold 2008). There are several candidates for the stone. Among them are “Iceland Spar” calcite of which a coveted optical-quality variety was found abundantly in eastern Iceland, and the blue variety of the mineral cordierite, found in Norway and popularly known as “Viking’s Compass” and as the gem “iolite.” While the latter’s extraordinary pleochroism is explored in the authors’ article “Blue Minerals: Exploring Cause & Effect” (Skalwold and Bassett 2016), the more likely candidate, Iceland spar, is the classic model for demonstrating the phenomenon of birefringence and doubling in optically anisotropic minerals. However, whether one’s adventures with minerals are land-bound or at sea, before venturing far there is some trouble with doubling to untangle first. •	Printable high-resolution PDF file (may be printed full-bleed on 11 x 17 inch folded paper for two-page spread booklet or as individual pages with white border on 8.5 x 11inch), (10.7 MB) no cost. •	Reduced size PDF for online viewing (front and back covers with two-page spreads within), (2.7 MB) no cost. •	Interested in a print copy? Order online here. Quartz: a Bull’s Eye on Optical Activity. Abstract: It might be overstating a bit to say that if one could understand all there is to know about quartz, then everything else in the universe would make sense. Without doubt, this mineral has profoundly impacted many sciences and technologies which we rely upon today. At the very least, quartz provides one with a host of mental gymnastics and a seemingly endless variety of puzzles to ponder. Not least among its fascinating properties is that of optical activity, its manifestation of which results in the special optical figure affectionately known as the “bull’s eye.” In the authors’ article on causation of blue color in minerals, mention is made of the quartz monochromator, an obscure instrument which makes use of optical activity in a very elegant way (Skalwold and Bassett 2016). In hopes of giving readers insights and appreciation for this ingenious device and for quartz itself, the following is an exploration into the nature of the chromatic phenomenon which plays out within this proverbial black box. •	Printable high-resolution PDF file (may be printed full-bleed on 11 x 17 inch folded paper for two-page spread booklet or as individual pages with white border on 8.5 x 11inch), (11.7 MB) no cost. •	Reduced size PDF for online viewing (front and back covers with two-page spreads within), (2.2 MB) no cost. V. A. Zharikov, V. L. Rusinov, A. A. Marakushev, G. P. Zaraisky, B. I. Omelianenko, N. N. Pertsev, I. T. Rass, O. V. Andreeva, S. S. Abramov, K. V. Podlessky, Y. B. Shapovalov, M. S. Seredkin, V. A. Golovina (1998). ISBN 5-891176-038-X. English translation by Jean Verkaeren and Jacques Duchesne, assisted by Bernard Guy and with the authorization of the authors. 22 tables, 127 figures, 462 bibliographic references. First online: April 2015. The main types of metasomatic processes are described and the theoretical bases of metasomatism are developed in accordance with the theory of D. S. Korzhinsky. Thermodynamics, dynamics and ideas concerning self-organisation of metasomatic processes are developed according to the current theoretical level. Results are given concerning technics of experimental study of metasomatism. The relation of metasomatism to ore deposits is discussed, and the new concept of formation of ore-concentrating dense salt melts and related light metasomatic fluids is proposed. The significant part of the monograph contains the characteristics of the main metasomatic families and rocks. Detailed characteristics of geological setting, mineral composion, facies and genetical considerations are given based on original and literature data. Download entire volume Metasomatism and Metasomatic Rocks as individual pdf pages in a zipped folder, no cost (302.9 MB). Robert M. Hazen, Adrian P. Jones, and John A. Baross, Editors (2013) i-xv + 698 pages. ISBN 978-0-939950-90-4. Carbon in Earth is an outgrowth of the Deep Carbon Observatory (DCO), a 10-year international research effort dedicated to achieving transformational understanding of the chemical and biological roles of carbon in Earth (http://dco.ciw.edu). Hundreds of researchers from 6 continents, including all 51 coauthors of this volume, are now engaged in the DCO effort. This volume serves as a benchmark for our present understanding of Earth's carbon - both what we know and what we have yet to learn. Ultimately, the goal is to produce a second, companion volume to mark the progress of this decadal initiative. This volume addresses a range of questions that were articulated in May 2008 at the First Deep Carbon Cycle Workshop in Washington, DC. At that meeting 110 scientists from a dozen countries set forth the state of knowledge about Earth's carbon. They also debated the key opportunities and top objectives facing the community. Subsequent deep carbon meetings in Bejing, China (2010), Novosibirsk, Russia (2011), and Washington, DC (2012), as well as more than a dozen smaller workshops, expanded and refined the DCO's decadal goals. The 20 chapters that follow elaborate on those opportunities and objectives. A striking characteristic of Carbon in Earth is the multidisciplinary scientific approach necessary to encompass this topic. 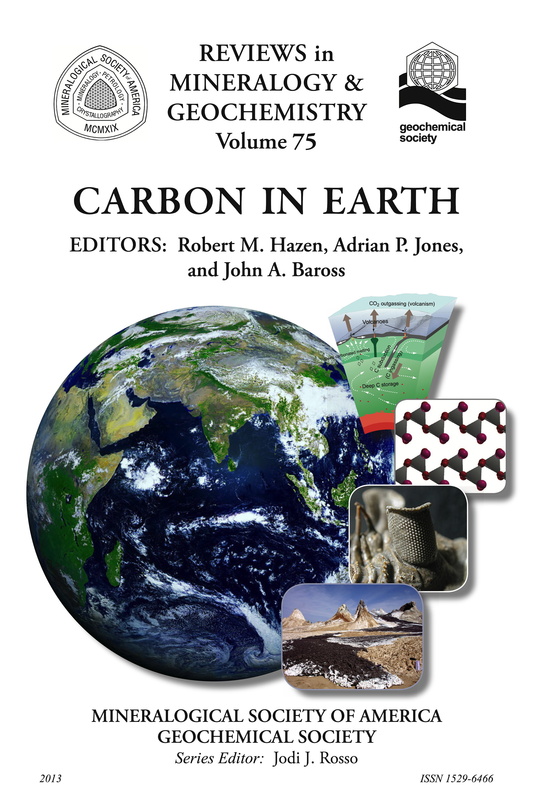 The following chapters address such diverse aspects as the fundamental physics and chemistry of carbon at extreme conditions, the possible character of deep-Earth carbon-bearing minerals, the geodynamics of Earth's large-scale fluid fluxes, tectonic implications of diamond inclusions, geosynthesis of organic molecules and the origins of life, the changing carbon cycle through deep time, and the vast subsurface microbial biosphere (including the hidden deep viriosphere). Accordingly, the collective authorship of Carbon in Earth represents laboratory, field, and theoretical researchers from the full range of physical and biological sciences. A hallmark of the DCO is the desire to implement advanced strategies in communications, data management, engagement, and visualization. Accordingly, this volume incorporates some novel aspects. Thanks to sponsorship by the Alfred P. Sloan Foundation, which continues to provide significant support for the DCO, this is the first of the RiMG series to be published as an Open Access volume. The links to the free downloads of the entire book, or individual parts, chapters, supplements, or videos are included with the Table of Contents of the book. Carl I. Steefel, Simon Emmanuel, Lawrence M. Anovitz, Editors (2015) i-xiv + 491 pages. ISBN 978-0-939950-96-6. The pore scale is readily recognizable to geochemists, and yet in the past it has not received a great deal of attention as a distinct scale or environment that is associated with its own set of questions and challenges. Is the pore scale merely an environment in which smaller scale (molecular) processes aggregate, or are there emergent phenomena unique to this scale? Is it simply a finer-grained version of the “continuum” scale that is addressed in larger-scale models and interpretations? We would argue that the scale is important because it accounts for the pore architecture within which such diverse processes as multi-mineral reaction networks, microbial community interaction, and transport play out, giving rise to new geochemical behavior that might not be understood or predicted by considering smaller or larger scales alone. Fortunately, the last few years have seen a marked increase in the interest in pore-scale geochemical and mineralogical topics, making a Reviews in Mineralogy and Geochemistry volume on the subject timely. The volume had its origins in a special theme session at the 2012 Goldschmidt meeting in Montreal where at least some of the contributors to this volume gave presentations. From the diversity of pore-scale topics in the session that spanned the range from multi-scale characterization to modeling, it became clear that the time was right for a volume that would summarize the state of the science. Based in part on the evidence in the chapters included here, we would argue that the convergence of state of the art microscopic characterization and high performance pore scale reactive transport modeling has made it possible to address a number of long-standing questions and enigmas in the Earth and Environmental Sciences. Among these is the so-called “laboratory-field discrepancy” in geochemical reaction rates, which may be traceable in part to the failure to consider porescale geochemical issues that include chemical and physical heterogeneity, suppression of precipitation in nanopores, and transport limitations to and from reactive mineral surfaces. This RiMG volume includes contributions that review experimental, characterization, and modeling advances in our understanding of pore-scale geochemical processes. 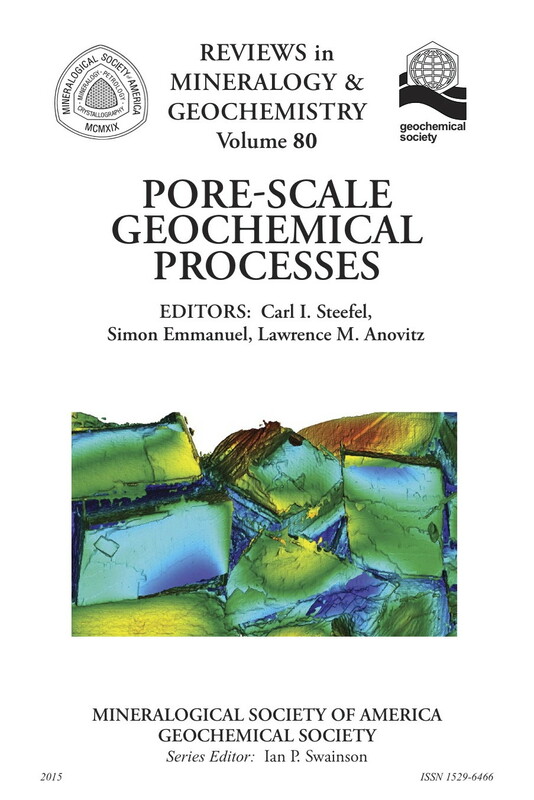 The volume begins with chapters authored or co-authored by two of the éminences grises in the field of pore-scale geochemistry and mineralogy, two who have made what is perhaps the strongest case that the pore-scale is distinct and requires special consideration in geochemistry. The chapter by Andrew Putnis gives a high level overview of how the pore-scale architecture of natural porous media impacts geochemical processes, and how porosity evolves as a result of these. The chapter makes the first mention of what is an important theme in this volume, namely the modification of thermodynamics and kinetics in small pores. In a chapter authored by Røyne and Jamtveit, the authors investigate the effects of mineral precipitation on porosity and permeability modification of rock. Their principal focus is on the case where porosity reduction results in fracturing of the rock, in the absence of which the reactions will be suppressed due to the lack of pore space. The next chapter by Emmanuel, Anovitz, and Day-Stirrat addresses chemo-mechanical processes and how they affect porosity evolution in geological media. The next chapter by Anovitz and Cole provides a comprehensive review of the approaches for characterizing and analyzing porosity in porous media. Small angle neutron scattering (SANS) plays prominently as a technique in this chapter. Stack presents a review of what is known about mineral precipitation in pores and how this may differ from precipitation in bulk solution. Liu, Liu, Kerisit, and Zachara focus on porescale process coupling and the determination of effective (or upscaled) surface reaction rates in heterogeneous subsurface materials. Micro-continuum modeling approaches are investigated by Steefel, Beckingham, and Landrot, where the case is made that these may provide a useful tool where the computationally more expensive pore and pore network models are not feasible. The next chapter by Noiriel pursues the focus on characterization techniques with a review of X-ray microtomography (especially synchrotron-based) and how it can be used to investigate dynamic geochemical and physical processes in porous media. Tournassat and Steefel focus on a special class of micro-continuum models that include an explicit treatment of electrostatic effects, which are particularly important in the case of clays or clay-rich rock. Navarre-Sitchler, Brantley, and Rother present an overview of our current understanding of how porosity increases as a result of chemical weathering in silicate rocks, bringing to bear a range of characterization and modeling approaches that build toward a more quantitative description of the process. In the next chapter, Druhan, Brown, and Huber demonstrate how isotopic gradients across fluid–mineral boundaries can develop and how they provide insight into pore-scale processes. Yoon, Kang, and Valocchi provide a comprehensive review of lattice Boltzmann modeling techniques for pore-scale processes. Mehmani and Balhoff summarize mesoscale and hybrid models for flow and transport at the pore scale, including a discussion of the important class of models referred to as “pore network” that typically can operate at a larger scale than is possible with the true pore-scale models. Molins addresses the problem of how to represent interfaces (solid–fluid) at the pore scale using direct numerical simulation. This pamphlet was distributed by the Mineralogical Society of America. Written by C. S. Hurlbut, MSA Secretary (1945-1958), Harvard University, Cambridge, MA, USA. exact date unknown. •	Printable high-resolution PDF file, (6.7 MB) no cost. •	Reduced size PDF for online viewing, (504 KB) no cost. Joint Meeting of the American Crystallographic Association and the Mineralogical Society of America, Bozeman, Montana July 27-July 31, 1964. Joint Meeting of the American Crystallographic Association and the Mineralogical Society of America, Gatlinburg. Tennessee June 27 - July 2. 1965. Prepared for the Joint Meeting of the American Crystallographic Association and the Mineralogical Society of America, Gatlinburg, Tennessee June 27 - July 2, 1965.